Two ingredients. TWO. That’s all it takes to make this simple and delicious Cream Cheese Salsa Dip. Subscribe here for free so we can continue sharing simple recipes and encouragement! Some of you might remember this recipe. I added it as a tiny little page way back in the beginning days of this site. I decided it was high time I re-share it as an actual post in easy-to-read and print form. It’s especially exciting to share as I’ve recently learned how to put it together more easily. The six minute version: Put ingredients in a bowl and mix with a hand mixer. Watch to see that cream cheese and salsa don’t fly up and smear your glasses and forehead. Clean up many splatters all over the kitchen countertop. But at least the dip is good. The three minute version: Put ingredients into a high power blender. (I have a Blendtec and don’t know how I ever lived without one.) The end. 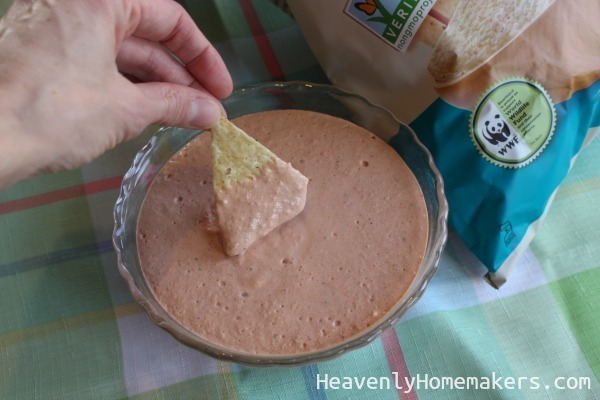 My kids make this Cream Cheese Salsa Dip regularly. They love eating it after soccer or basketball practice. It’s great to take to parties. It’s a huge hit no matter who we serve it to, and have I mentioned that it’s made with only two ingredients? Any guesses as to which two ingredients? It’s a tough one, given the very vague title of the recipe. Take your time. Blend ingredients together (preferably in a blender, but a hand mixer works too!). I daresay this Cream Cheese Salsa Dip with tortilla chips with a side of a No Bake Cookie Cup is a pretty good combo. A little sweet. A little salty. A lot of happiness. Stay tuned for more Simple Snack Recipes still to come! Subscribe here for free so you won’t miss the fun! With a busy family like mine, two ingredient recipes are a gift from heaven. Thank you for sharing this recipe! We are having tacos later this week for dinner. I’ll be adding this to the meal. Have a great day! This is one of our favorites, so we make it about once a week for a snack. I usually make it in a sauce pan, stirring with a spoon to combine, because my girls like it warm. ???? Yummy! That’s how I make bean dip! 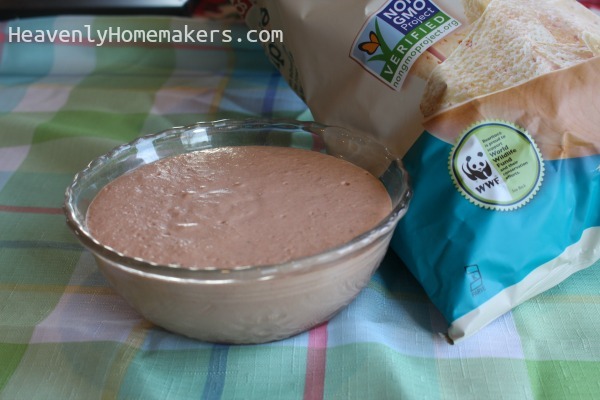 (add in a can of refried beans to your recipe) It’s delicious and people always ask for the recipe! We like it hot and cold. Can’t decide which is best. Oooo….I never thought of blending them together! 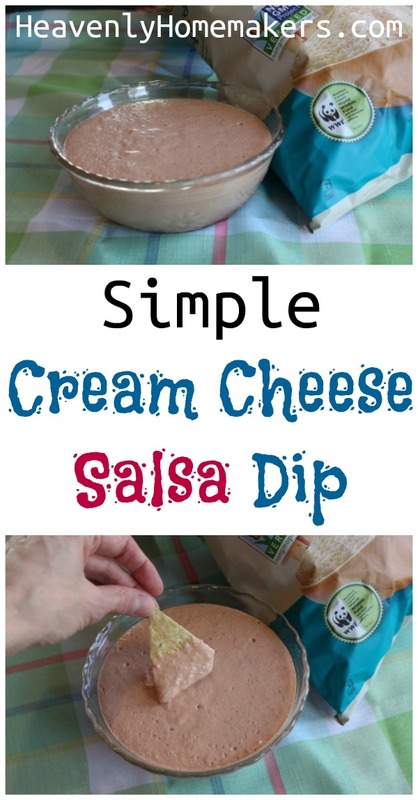 We always just pour the salsa over a block of cream cheese, but I like this idea even better.